I hate it when I get caught out by getting caught up in the hype of a new release, only to then be severely disappointed. The film starts off very slowly, usually this time is used to build some characterization and give us a sense of what's happening. This time is mainly wasted and we are given minimal character building. We're given one dimensional characters and they never build on them at all, it also isn't helped by the fact that not one of them is likable so you don't find yourself rooting for any of them. 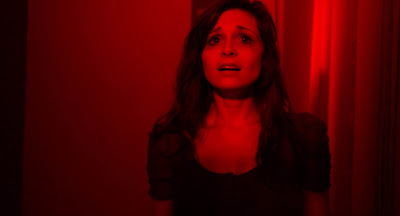 When things finally get going it's all very weak jump scares that are highly predictable for anyone who's seen a Horror film, not only is it that predictable it's full of many huge plot holes that can't be forgiven. I seriously wanted to like this film, I really did, but in the end even a short 80 minutes seemed to long and a dreadful, corny ending caps off an horrendous film. Yes, I thought it was that bad. "The Gallows" is just a waste of potential, don't waste your time on it. Most of the film's budget came from people who had never invested in a film before and were local friends of the film-makers in Central California. Was independently funded and produced before being picked up and distributed by Warner Bros. Most all actors/actresses go by their real life names in this film. Most use their first name and a different last name for their characters. Ryan Shoos goes by his real first and last name for his character. The distributors were rumored to have created the popular #CHARLIECHARLIE Challenge that went viral in May of 2015 as a marketing ploy. However, the #CHARLIECHARLIE challenge actually started popping up on sites such as YouTube long before the film was even made, and only after it became a sensation did the filmmakers decide to utilize the game in some marketing. Having been shot in Fresno, California, the film was inexpensive to make due to the friendly city/environment. The co-writer/director Travis Cluff was a contestant in season 2 of Wipeout ("Super Shorts") and won. Cassidy is Kathy Lee and Frank Gifford's daughter. The original town is Beatrice, Nebraska. The film promoted the killer Charlie Grimille as a killer along the lines of horror icons Jason Voorhees, Freddy Krueger, Michael Myers and Leatherface; citing their franchises and signature weapons in a theatrical release trailer before advertising Charlie and his signature weapon: the noose. Following the film's theatrical release the character of Charlie Grimille has helped reforge the highly popular urban legend game of Charlie, Charlie and set forth a Halloween franchise costume. With the film already making a stake at the box office following the release of Universal smash hits Jurassic World and Minions The Gallows is put on the greenlight list for possible sequels, spin-offs and or prequels ensuring the possibility of Hangman Charlie becoming a slasher film icon as intended. One of Cluff's favorite scenes-coincidentally shot on a Friday the 13th, on the thirteenth day of principal photography-also maintained an air of realism for most of those involved. "No kidding, it was the thirteenth day, on a Friday the 13th, and we were hanging someone." That scene, which actually opens the film, has the look of having been shot on a home video camera. The bulk of the movie, however, takes place 20 years later and is meant to be seen mainly through the lens of today's ever-present video camera: the cell phone. Certain exteriors were accomplished in Lofing's hometown of Beatrice, Nebraska, the setting for the film. However, "The Gallows" was shot primarily in and around Fresno, California. Utilizing Veteran's Memorial Auditorium as the main setting for the story, the filmmakers shot night-for-night, adding to the realism for both the cast and, ultimately, moviegoers. "Night-for-night interiors are rare," Blum observes, "but it was done to give the actors the true feeling of, well, being out in the middle of the night, just like their characters." To help induce a real sense of fear in their cast members that would translate into their performances, Cluff and Lofing cast actors out of Los Angeles who knew nothing of the Fresno, California, locations where they'd be shooting, many of which are said to be haunted. Additionally, the directors only revealed the script to the talent little by little over the course of production, and also shared photos, newspaper articles and websites with them that referenced the story of Charlie Grimille and related incidents that had happened subsequent to his death. Lofing states, "Travis came up with the initial concept, and we developed it from there until we had a rough script. Then we shot a promo trailer, mainly just so we could see how it worked, if it looked scary to us." The fates of Ryan, Cassidy and Reese are foreshadowed in terms of the event preceding the night at the school. Pfeiffer and Mr. Schwendinman instill the motto of Break A Leg which Ryan and Pfeiffer discuss in relation to chagrin, Price's revenge fall prank on Ryan in the auditorium as well Ryan playing with the boardwalk support ropes, Cassidy and the door slam as she is separated by Charlie from Ryan, Cassidy's fiddling with the left portion of her neck on the football field with Ryan's home camera indicates to the burns and cuts from Charlie's grab and the overall role of Reese's character August in the play and his father Rick's connection to Charlie. The sequence starting up the cover of Smells Like Teen Spirit by Think Up Anger and Malia J was initially scripted as occurring when Charlie has all the lockers fling open on an unexpecting Cassidy. The scene was prominently featured in the theatrical trailer and ultimately scrapped in the theatrical release, the scene was intended to announce the threat of Charlie as more a tormentor then actual immediate deadly threat, as well as being an ironic connection to Ryan's shirt retaliation to Price with the closing locker. However it was eventually decided between Cluff and Lofing that the film was an overall teenage slasher film and hence the scene was replaced with Charlie's invisible hand grasping Cassidy by the side of the neck and leaving her with bloody damage. The ironic tie-ups of the initial script also helped shaped the writers/directors' decisions to settle the film as a found footage slasher film, as upon review preceding classics of the subgenre (Blair Witch, VHS, Paranormal Activity) were not in fact slasher horror films. With Blumhouse and Entertainment 360 on board to co-produce and co-finance, the directors-who also served as editors as well as handling the visual effects-were able to finalize the film. Written, directed and produced by Chris Lofing and Travis Cluff and shot entirely outside of the Hollywood system, the horror film "The Gallows" found its way to the big screen thanks to the filmmakers' use of a much smaller one-the computer-and their own ingenuity. Online rumors as to the roles that would eventually be Ryan Shoos and Cassidy Gifford's characters were that Kathryn Newton and Jack Quaid were offered the roles that would eventually become Ryan and Cassidy.